The story I'm trying to recall had the explorers stranded on the surface of some planet. I recall that there was a body of water, and a large alien creature which had a large, globular, transparent body with a nucleus giving it the appearance of some sort of cyclops. The creature would grab anything/one that disrupted its environment. Generally, it was a hard-science escape puzzle story. Your description reminds me of a story I read in The Magazine of Fantasy and Science Fiction called Polyphemus by Michael Shea. It got the cover of that issue. I don't remember much about it, but your brief description made me think of it, and the cover illustration makes it seem like it could match. The story has been anthologized a few times. 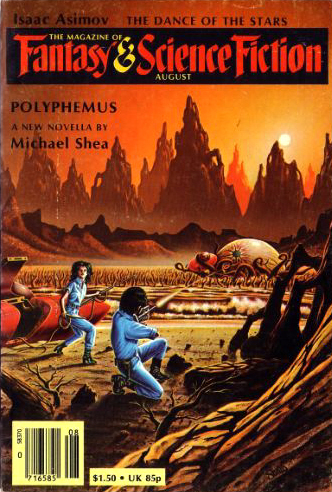 In fact, when I looked at that link, I realized I have the story in The 1982 Annual World's Best SF, so I re-read it. Now I'm a little more confident in the identification. The "body of water" you mention is a lake inside a volcanic crater. It was a titanic eye - a transparent orb of gold, intricately veined within, the pupil a scarlet rhomboid into which five sand-hogs could have been driven abreast. Deep in the yellow ichor, black shapes moved, whole constellations of them swarming through the kelp-like jungle of veins, while outside the globe, round its base, a collar of huge tongue-like tentacles stirred, stretched, and licked the air. Not the answer you're looking for? Browse other questions tagged story-identification animals .